"Kamchatka is a classic smoke color for smudging, layering, and blending to create a bold statement anytime." NARS Kamchatka eyeshadow is part of the Fall 2013 makeup collection. There are 3 other eyeshadows in this collection - Yamal (brownish-beige), Namibia (grey) and Bavaria which seems like a muted shimmery teal. I have a couple of NARS matte eyeshadows that I love, and that's why I snapped up Kamchatka without waiting for any swatches. The color is described as a "navy smoke" by NARS. It is a matte, dusty/faded greyish-bluish-purple. Scroll on for photos, swatches, and more. Not sure why NARS decided to name this eyeshadow Kamchatka. NARS Kamchatka matte eyeshadow - warmer lighting brings out more of the purple tones. NARS Kamchatka is a muted/dusty blue-purple shade. Depending on the light, the color leans more blue/navy (in cooler lighting) and purple in warmer lighting, but it definitely manages to find a good balance between the two. The NARS matte eyeshadows I have tried so far have all been quite soft and pigmented with absolutely no fallout. Kamchatka, on the other hand, feels powdery. The pigmentation is sheer to nonexistent if you are planning on doing a lot of blending, but if you just pack on the color it can be built up to what is seen in the pan. All swatches are on dry skin and dry shadow. 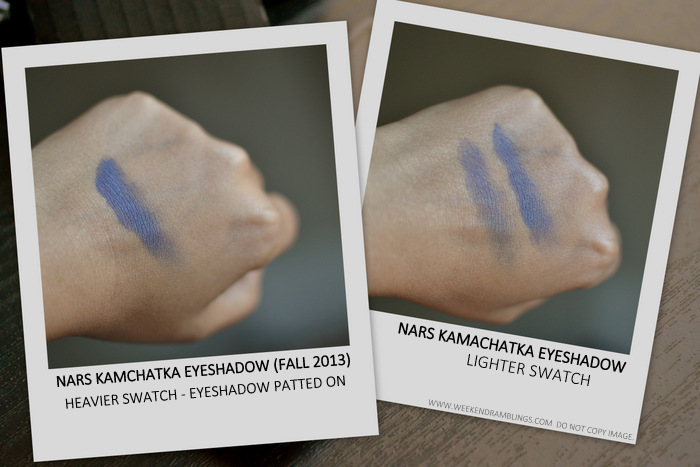 For the heavier swatch, I just patted on the shadow to build up the intensity. This works on hands, but on my eyes, I would need something for it to latch on to or the shadow would just disappear in to time. The lighter swatches show how sheer the shadow can get. When blended with a brush, the color would just brush right off if used on it's own. NARS recommends Kamchatka as the perfect color for a soft smoky look. Use this color to add depth to any neutral shadow. Smudge along the lash line for a soft smoky look, says Jason Hoffman, Lead Trainer for NARS. All very good, except it just disappears if you try to do any blending. Pooof..gone! That said, Kamchatka looks best just as recommended so long as you use a stickier base such as a cream shadow or a pencil liner. I tried it over a matte eyeshadow, and it really doesn't show up all that very well. Here's how I used NARS Kamchatka. NARS Kamchatka smudged along lashline and blended along outer corner. Additional makeup used: Base eyeshadow - greyish taupe shadow from Chanel Mystere quad. UD Perversion eyeliner for tightlining and lashline. NARS Kamchatka Eyeshadow used as an all-over lid color. UD Desperation (greyish-taupe) Eyeliner as a base. UD Perversion along lashline and tightlining. Matte black eyeshadow just along lashline. Partly because of my darker skin color and also because Kamchatka is a sheerer color, it shows up more greyish blue than purple when I try smudging it along the lashline. I used a powder eyeshadow as a base, and from what I have tried so far, Kamchatka shows up better if it's used on a stickier base for it to latch on to. I also used it over a UD eyeliner (greyish-taupe Desperation) as a base. The color really shows up quite well on this. This is a powdery eyeshadow, and tapping off the excess from the brush is a must to avoid showers all around the eye area :P It doesn't take too well to blending/buffing either - just place it where it needs to go and do some gentle blending around the edges to take off any harsh lines. Any more, and there won't be much of the shadow remaining. Despite all that, I liked Kamatchatka. Because it has a dusty, muted quality to it, this is a very wearable bluish purple. Depending on the base color used, I can tone down or brighten the color. It stayed on the whole day on my eyes, though I did use a primer and/or long-wearing base color. I don't think Kamchatka is the sort of color that would appeal to everyone. I have scoffed at enough washed out, watered down browns and blacks to know that. It is a very wearable color, though, and if these sort of muted shades appeal to you, and you are willing to put in some effort into making this work, do give NARS Kamchatka a try. i dont know what me write all this here ? you knowwwwwwwwwwwwwwwww that right ? And really..you are wayy tooo generous...and thank you! Wow. This is very much my kinda shade.... I can see me wearing it witha white dress.